Gent Xenex control panels are designed to provide owners of small premises with quality protection equipment at an economical price. BSIU approved to EN53: Parts 2 & 4, Gent Xenex control panels can be used on installations meeting BS5839: Part 1. Each Gent Xenex panel contains an integral power supply and battery support to drive up to 8 alarm sounder circuits, 2 auxiliary relay contacts, zone disablement facility and one-man test and commissioning features, designed to simplify installation. 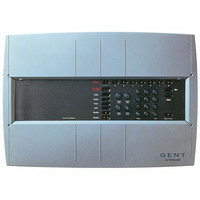 Please browse our range of Gent by Honeywell Xenex Control Panels below. Highly cost effective option for small building premises requiring coverage for up to eight zones. Certified to EN54 Parts 2 & 4, the Xenex panel contains integral power supply and battery standby for up to 72hrs.